The title of Deerhunter's eighth album could be a kind of metaphysical question, but the record has an up-close material tone crackling with friction. Why Hasn't Everything Already Disappeared? wrestles with escapist and confrontational impulses, and continues the band's exploration of shifting sonic identity. Ten years ago, Deerhunter frontman and songwriter Bradford Cox was in the midst of what has so far proven to be his most prolific period. In 2008 alone, Cox put out Let the Blind Lead Those Who Can See But Cannot Feel, his first Atlas Sound solo album, followed by two Deerhunter studio albums, Microcastle and Weird Era Cont., released more or less together. Around all of that activity, Cox was regularly tossing up worthy lo-fi recordings like the Things I'll Miss EP on his blog for free. Clearly, it was an inspired time for him, and it was an inspiring time to be a Deerhunter fan as well, knowing that new material could come from this camp at any moment. Creative productivity like that is, of course, nearly impossible to keep up for long. When it is sustained, quality typically begins to suffer at some point. Perhaps mindful of maintaining his standards, Cox no longer keeps up that previous pace of output. Atlas Sound has been pulled over to the side of the road since reaching Parallax in 2011, despite that third album being a highly regarded peak for Cox's solo work at the time. In a recent interview, Cox maintains that he's "not really interested in solo projects at this point". If not surprising, that statement is sure to disappoint a few people. The concentrated focus of energy from Monomania in 2013 onward has been apparent. Among other things, Monomania was the band's first foray into the conscious presentation of a unified character, best witnessed on their Jimmy Fallon performance of the title track. It was a visual turn from an indie rock band to an indie rock band time-warped from the Bowery in the 1970s, a performative effigy to a past life as a punk. 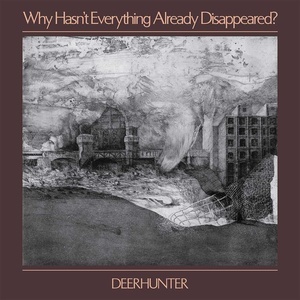 Deerhunter continue to tinker with their identity on Why Hasn't Everything Already Disappeared?. To make the album, the band headed out to the small Texas arts hub of Marfa, acquiring matching Western hats in the process (a gesture of persona more '80s U2 than '70s Bowie), but the record they came back with would sit as comfortably in a European drawing room as it would among the strange lights of that high desert town. In that same interview, Cox reveals an elevated sense of anticipation, positing a question about one of the album's songs that he hasn't been asked yet, and getting out ahead of the "baroque pop" tag that will surely follow Why Hasn't Everything Already Disappeared? given some of its more ornately walking arrangements and the regular implementation of harpsichord throughout. Artists almost always reject such labels, but he does have a point. Cox is a consummate student of modern music, so to think that he is only now finding his way to the Left Banke doesn't really give him enough credit. Still, though his guides may be composers from prior centuries, the original sources and not the '60s pop relayers, the result is still, to be reductive, rock music with harpsichords. Along that line, Why Hasn't Everything Already Disappeared? both does and doesn't 'rock' like previous Deerhunter records. Some of that is down to elements of the production, particularly the fuzzy close-up, almost muffled drum sound, which contributes to a condensed atmosphere throughout the album. Three producers aside from the band themselves are credited here: Ben Etter, Ben H. Allen, and Cate LeBon. The aesthetics of the latter two, in particular, seem to push and pull the album, often in the same song; the imperfect intimacy of Drinks, LeBon's band with Tim Presley (who also makes an appearance, providing lead guitar on "Futurism"), and the bolder palette of Allen for bigger moments. "No One's Sleeping" pushes the incompatible together in more ways than one. Written in response to the tragic murder of British MP Jo Cox in 2016, musically it is one of the most upbeat songs, with a "village green" nod to the Kinks and lyrics left vague enough to keep it from standing for a single incident. The song builds into an extended coda jam, but it never quite breaks open the way a song like "Saved By Old Times" from Microcastle does. The more condensed vision of Why Hasn't Everything Already Disappeared? isn't a retreat from the full-spectrum gleam of Fading Frontier, but Deerhunter seem determined (as always) not to repeat themselves. That has long been one of the values that keeps them compelling. By running time and track count, the album isn't much shorter than any of their previous LPs, but there are places where it feels hastened, most noticeably in the way "Element" runs right into "What Happens to People?" without a pause for breath. Modern attention spans may have been a factor in this (judging by the album's press release), but it could also be a result of the determination to densely pack each moment. Why Hasn't Everything Already Disappeared? has its high-minded lyrical concerns (the problems of the present, the problem with romanticising the past) and musical flourishes informed by the Old Continent and corners of Americana, but the greater picture and its many curious details -- Cox's theatrical enunciations in "Element", the stream-of-consciousness zig-zag globe trot of "Détournement", the Eastern Bloc hallucinations of "Tarnung" -- come together only upon repeated listens. In that sense, then, it's a classic album-fan's album, attention spans be damned.